It’s said that water-soluble substances can diffuse through cell membrane with less ease than lipid-soluble substances because the former encounters impedance in the hydrophobic region of the phospholipid bilayer. However, does the same logic not apply for hydrophobic substances, in that they cannot traverse the hydrophilic outer/inner surfaces of the plasma membrane? How would they be able to enter or leave the cell with greater ease? During passive diffusion, a molecule simply dissolves in the phospholipid bilayer, diffuses across it, and then dissolves in the aqueous solution at the other side of the membrane...Passive diffusion is thus a nonselective process by which any molecule able to dissolve in the phospholipid bilayer is able to cross the plasma membrane and equilibrate between the inside and outside of the cell. Importantly, only small, relatively hydrophobic molecules are able to diffuse across a phospholipid bilayer at significant rates (Figure 12.15). Thus, gases (such as O2 and CO2), hydrophobic molecules (such as benzene), and small polar but uncharged molecules (such as H2O and ethanol) are able to diffuse across the plasma membrane. Other biological molecules, however, are unable to dissolve in the hydrophobic interior of the phospholipid bilayer. 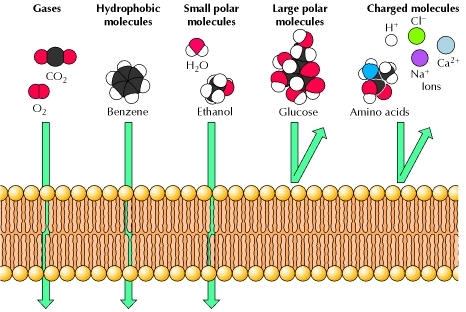 Consequently, larger uncharged polar molecules such as glucose are unable to cross the plasma membrane by passive diffusion, as are charged molecules of any size (including small ions such as H+, Na+, K+, and Cl-). The passage of these molecules across the membrane instead requires the activity of specific transport and channel proteins, which therefore control the traffic of most biological molecules into and out of the cell. As shown in above paragraph, molecules have to dissolve in phospholipid bilayer to diffuse through it. But since the hydrophilic part is already interacting with water, so dissolving is mainly for the hydrophobic part. Now, since hydrophobic part is non-polar, so it can dissolve only non-polar substances (like dissolves like). Thus, small gases like O2, CO2 and non-polar molecules like benzene easily dissolve in hydrophobic part and diffuse through it. Also, molecules like water and ethanol can also dissolve in it in small amounts due to their small size and very less polarity. That's why only some molecules of water can diffuse passively, large amount of water would require aquaporins. Now, since bigger molecules like glucose have large size and high polarity, they cannot dissolve in the membrane and thus require transmembrane channels even for diffusion. Similar case is with ionic substances too: they require ion channels for their diffusion. Hope this helps. Comment below if you have any further doubts. Not the answer you're looking for? Browse other questions tagged biochemistry cell-biology cell-membrane membrane-transport plasma-membrane or ask your own question.